Insoles with arch fills designed to prevent diabetic foot ulcers could be having an adverse impact on postural stability, according to new research led by Plymouth University. A study by the Balance Enhancement Ulcer Prevention (BEUP) research group, led by Dr Joanne Paton, Podiatrist and Research Fellow of National Institute of Health Research (NIHR), found that designs containing an arch fill generated increased body sway and reduced balance when the wearer was standing still, while those without an arch fill did not. The study was carried out to explore whether different insoles affected balance in people with diabetes. Lack of balance is a major problem for older people with diabetes, a third of whom fall each year – rising to half for those with prior foot ulceration. The results of Dr Paton’s analysis also contradict previous suggestions that soft insole materials shield the sense of awareness under the soles of the feet required to help maintain balance, and therefore appear safe for people with diabetes to wear. Entitled Getting the right balance: Insole design alters the static balance of people with diabetes and neuropathy, Dr Paton’s study forms part of a five-year research programme funded by the NIHR to develop and test a novel dual purpose insole that both enhances balance and reduces foot ulcer risk in people with diabetes. “Falls are a major concern for people with diabetes and neuropathy and it’s surprising that very little research has been done around different insoles’ effects on balance, when you consider that wearing padded, or offloading, insoles forms a recommended element of the diabetic foot ulcer prevention strategy. “Study participants, who were all diabetic, were asked to score how steady they felt when wearing each pair of insoles, while standing with their eyes closed on a special mat used to measure balance. 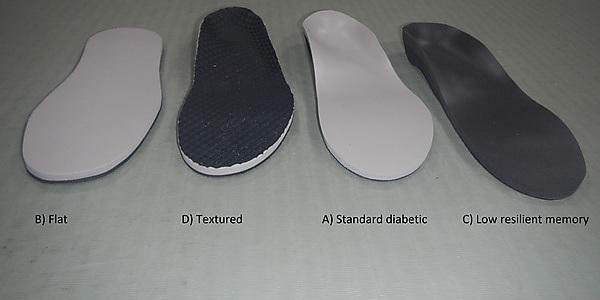 The insoles tested included a standard diabetic offloading insole and three alternative design variations; an insole shaped to the foot with a textured top surface, a flat insole, and an insole shaped to the foot with a slow return memory material cover. “The standard diabetic offloading insole and the insole with the slow return memory cover showed increased body sway and reduced balance when compared to the others – the common entity was the arch fill. The results suggest that insole design might artificially alter the sense of awareness on the soles of the feet that contributes to the maintenance of postural stability in people with diabetes and neuropathy. The project is one of several related studies being conducted by the members of the Balance Enhancement Ulcer Prevention (BEUP) research group within the Institute of Health and Community at Plymouth University.